Kerry Millikin of Pine Plains, N.Y., won the three-day eventing individual bronze medal in 1996 (Atlanta) with Out and About, a Thoroughbred gelding owned by Millikin. People in general are wowed by the Olympics. I never tell anyone I’ve won a medal, but when they find out, they’re pretty excited. It’s a neat feeling, and it gives you a validation for all those years of hard work. The USET did such a tremendous job of handling all of our preparations for Atlanta, from paperwork to making sure our family members got tickets. Once we were there, we didn’t have to worry about anything else but giving the best performance we were capable of. For me, the most anxious competitive moment was going into the show jumping arena. I knew I was in contention for a medal, and I couldn’t afford to [drop] a rail. I might have lost by only one-tenth of a point, but who remembers fourth place? So that’s what I was thinking as I went into the arena. As far as you could see, there was a sea of cheering people. I remember feeling that energy and wanting to channel it in a positive way. “Outie” was only 8 at the Olympics, so he was quite green. He took a trot step during a lead change right before the big triple combination, but I didn’t let it bother me; I just did what I had to do. When we finished, the crowd realized we had won bronze and the applause just exploded, and Outie took off around the ring. That was a moment I’ll never forget. Because we were at an American Games, the crowd on cross-country day went wild. Outie loved it – you could just feel him surging on from the crowd. That was what really made the Oympics special for me – that amazing feeling of having the team behind you and everyone supporting one another. 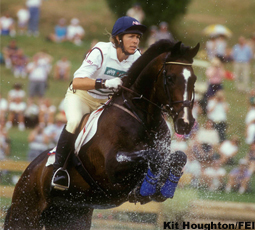 After Atlanta, Millikin and Out and About went on to place 7th at the Open European Championships at Burghley (England) in 1997, and won team bronze at the World Games in 1998 (Rome), finishing as the highest-placed Americans on that team. In 1999, the pair finished third at the prestigious Badminton CCI**** three-day event. Today, Millikin teaches and trains event horses and riders. 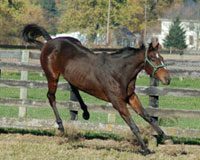 Outie lives in a 90-acre field near Millikin’s home since his retirement in 2000. 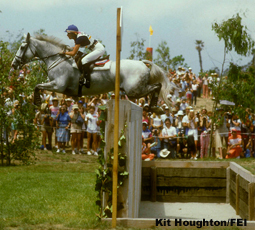 Karen Stives of Dover, Mass., was the individual silver and team gold medalist in eventing with Ben Arthur, owned by Lillian Maloney, at the 1984 Los Angeles Olympics. I don’t think I fully realized the impact of winning an Olympic medal until I stopped riding. In the eventing world, you’re always focused on the next big competition, and I’m not sure riding in the Olympics changes the way you’re received by the riding community. No doubt for me, my favorite memory from Los Angeles was winning a bet I made with our team coach, Jack LeGoff. We had three warm-up arenas at Santa Anita racetrack, where our dressage was held, and each one got you progressively closer to the main arena. Ben was going so well in the earlier warm-ups that it was scary. I didn’t want to change anything, so by the time I met Jack in the last warm-up ring, I was just walking around, waiting to go in. He said, “What are you doing? Why aren’t you getting to work?” I told him I had no idea what was going on, but whatever it was it was working, and I just wanted to wait until it was time for my test. The rider in front of me just had a fabulous score and Jack said, “I bet you can’t beat that rider’s score.” I said, “Oh yes I can.” He bet me a case of champagne and I said, “You’re on.” Ben went in and did the best test he’s ever done in his career. I savored every sip of that champagne! When I went into the show jumping arena, I knew both the team and individual gold medals were within our reach. But I couldn’t let myself think about that. There was no big trick to it, I just had to shut down all the distractions from the peripheral activities around me and focus on the job I needed to do. I shut out the crowds. I pretended I couldn’t see or hear anything around me and just thought about the jumps that were facing me. Show jumping was always Ben’s weakest phase, so I was incredibly relieved to have just one rail down, even though that meant losing the individual gold medal. It was the team medal that mattered most. The Brits, Australians and Germans fielded incredibly strong teams that year, so we really had our work cut out for us to win any medal, much less the gold. To win team gold against riders of that caliber was a huge honor. To this day I am proud and so thrilled to think that my performance made a difference. Karen Stives retired from international competition in 1990 and became a FEI-level eventing judge. She chaired the USET section committee for ten years and was inducted into the U.S. Eventing Association’s Hall of Fame in 2006. Stives gave Ben Arthur to a young rider, after retiring him from upper-level competition in 1986, on the condition that he would eventually retire at the rider’s family farm in NH. Ben lived out his life there and died in his mid-20s. 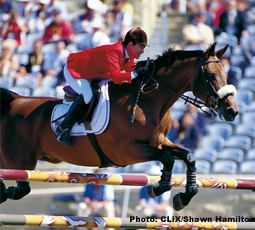 Margie Engle of Wellington, Fla., rode on the U.S. show jumping team at the 2000 Sydney Olympic Games riding Hidden Creek’s Perin, owned by Mike Pulaski. What was most memorable for me was the whole experience of the opening ceremonies and being around athletes from so many other sports. The entire city of Sydney was so welcoming and wonderful. Riding under pressure is part of our sport, so in that sense, the intensity at Sydney was no different from other international championships. What’s unique about the Olympics is the strong sense of the other riders depending on you, and knowing that you are representing your country. It was quite an honor. We had fantastic team camaraderie and a wonderful team coach in Frank Chapot. The riders from other countries that we competed against were all people we had known for years. I never felt like I was riding against them, as much as I was riding against the courses. 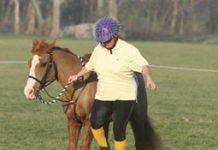 I focused on each course and knowing what sort of ride my horse would need for each round. Perin was still quite green at the time – he’d only moved up to Grand Prix in March before the Olympics. To have him finish in the top 10 individually was just incredible. He has so much heart and ability; he would try to do anything I’d ask him to. I aspired to ride in the Olympics since I was a kid. But you always think, that’s not realistic, that’s out of reach. So to be able to make the goal you’ve been striving for gives you a feeling of accomplishment that stays with you forever. You can’t help but feel good about satisfying a life-long goal. Engle still competes Perin, now 18, and will retire him when she feels the time is right. Engle, who has earned American Grand Prix Association Rider of the Year honors 10 times, has won more than 175 grand prixes and competed on more than 20 winning Nation’s Cup teams during her long and venerable career.